My first novel came out this week. It’s exciting to hold a copy in my hand and to think how long it took me to get there. It has, at times, felt as if I have been running a marathon for the past two years. Now it is out, another hard slog begins…the dreaded publicity and marketing. Really I’d like to wander off to another desert and forget about that side of things but that would be a pity. It’s a necessary job if I want the book to sell. A necessary job like the ironing – another task I tend to put off until I have almost nothing left to wear but socks and knickers (surely no one irons those!). So, the novel….it’s written, it’s published…it now needs a little TLC….and then there’s the next one to write…. Congratulations Bronwen! 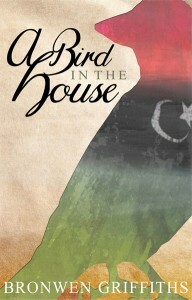 I’ve started reading A Bird In The House. It’s a lovely book; so beautifully written. I wish it lots of success. it was not just my love for Libya that made your book so special for me to share…it was simply a lovely story, beautifully written. I breathed in every sentence, and at times lived through your characters. Sadly, Libya is not turning out the way we both thought it would after the revolution, but I know we pray for the best. I have so much questions to ask you, and hope that perhaps I shall one day have the opportunity to meet you for that.